Bonnie wrote about 750 Words in one of her Slice of Life Story Challenge posts over the summer. I immediately signed up and got excited about writing (essentially) three pages every day. I did well, but then I had to go out of town for a speaking engagement. The hotel had internet, but my computer couldn’t pick up their wireless signal. I was defeated after missing a day. I thought about starting again when I returned home, but we were going on a “no computer” family vacation a few days later, so I realized starting the 750 Words again would be futile. On Monday morning, my uncle and I were on the phone and he asked me what I was working on (as a writer). While I told him I wrote every day, I didn’t have a concrete project I have been truly working on (unless you want to count raising a literate human being as a concrete project) to tell him about. Everything I’ve been writing has been on a private family blog and has been devoted to preserving memories about the things my daughter does on a daily basis. Certainly there’s a lot of fodder there for a children’s picture book (or several), but I felt slightly ashamed I couldn’t tell him about an article I was writing or a book project I had in the works. With a new sense of determination, I went online to 750 Words that night and started writing on there again. 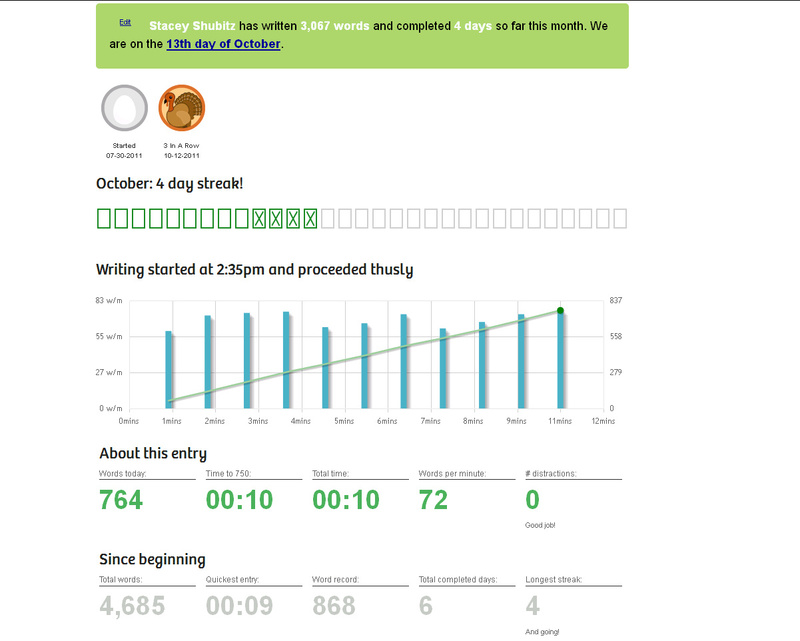 Today is the fourth consecutive day I wrote, in October, on 750words.com. In nine minutes flat I had my 750 words written. My entry meandered from topic to topic, but hey, it was a start. When I finished my entry, I looked at my stats and got excited. Then, I clicked around the site a bit more and found The 750 Words One Month Writing Challenge. 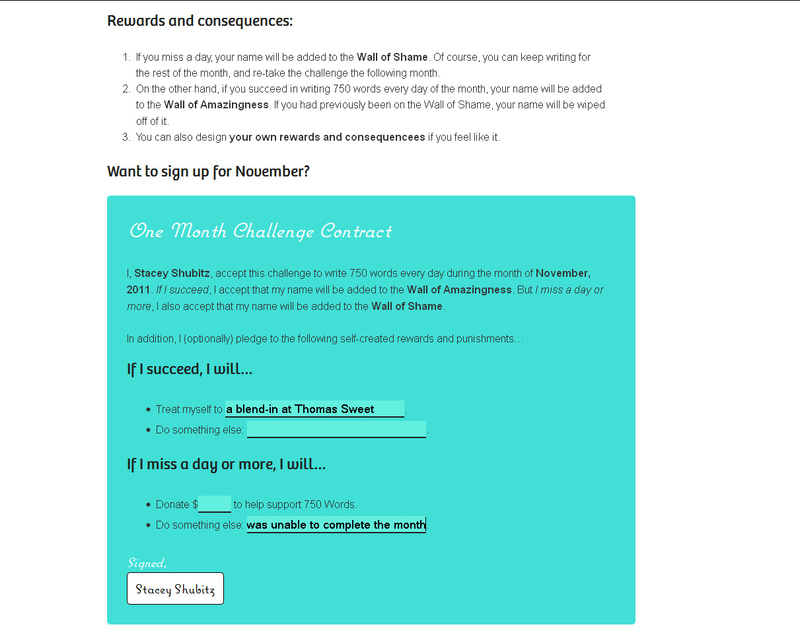 Since we are already halfway through with October, I immediately signed myself up for the November Challenge. I didn’t really give it a lot of thought. However, if I miss a day, my name goes on a “Wall of Shame.” I decided to further punish myself hold myself accountable by agreeing to write a post about why I missed a day on this blog if I miss a day of writing my 750 words in November. That’s going to sting if that happens, so I figure I will be writing daily. I’ve decided to use my 750 words/day to capture a lot of the stories and picture book ideas that have been swirling around in my head for the past year. I’ve been talking about writing a picture book for about five years… it’s time for me to actually do it. While being a wife, a mother, and a part-time literacy consultant doesn’t leave me with a lot of time to work on writing projects, I decided that it’s time for me to stop making excuses and to start writing a lot again. Have you used 750 Words? If so, please share a bit about your experience with the site with me. If you haven’t used it, and you want to light a fire under yourself to do more writing, then please check out the site and consider signing up! It’s exciting to hear your plans about writing a picture book. Today I was just getting myself re-organized and mapping out a plan for various projects I have going. I decided that I am going to wake up a certain amount of mornings a week early in order to work on the narrative portions of my dissertation. Though I won’t be using the actual site, I like the idea of three pages a day. That might be a good starting point for getting my ideas going and then going back to revise and refine. I admire you for taking on this challenge & wish I could, but just don’t have the time now. I think you’re right that it will help when you have one project to work with. It certainly will help with the self-discipline, to be responsible to others for the writing. Good luck! I just wrote today. Not sure if I can keep up daily but it did help me get some words out of my head this morning. That’s quite a commitment Stacey–and a great goal! I haven’t used 750 words, although I checked it out after Bonnie wrote about it. I hope you share your journey with us. Maybe I’ll brave the challenge at a later date. So I have been at this for the last few months. I like it but it does take time. Some days are torture and life does get in the way. What I hate is if you miss a day you don’t get a chance to go back. You should be able to go back, don’t you think? I shared my feelings, but no response. This happened to me last month, and just the other day this month. Writing is writing and if the commitment is there you should always be able to go back. I love though that you can click to see what it all means. There’s button too Stacey that has all your words over time, analyzed, under future..something. I love that and honestly I love the challenge and I’m not quitting. I love the way it analyzes the writing Bonnie. It’s incredibly intuitive. And yes, it would be nice if you could go back. Alas, it’s not a perfect tool.